When you shop for piping at your local fabric store, the lack of options can be frustrating. For most projects like pillows and slipcovers, you'll get the best color and pattern match if you make the piping yourself. Making piping may seem overwhelming but it's actually easy. All you need is some fabric, cotton cord, and a zipper foot for your sewing machine. Depending on the type of project you're doing you can make your piping on the bias, cut diagonally from the fabric, or straight. If you need your piping to go around a lot of curves it's better to cut on the bias. If you simply need it to follow a straight line, cut the fabric straight. The amount of fabric you need will depend on whether you're cutting straight or on the bias and how much piping you plan to make. To get started, you need to cut strips of fabric to cover the cotton cord. If you'll be cutting straight, simply use your ruler to cut with the grain of your fabric. If you'll be cutting on the bias, fold your fabric on the diagonal and cut along your folded edge. If you don't have a preference for the width of your binding, cut your fabric strips 2.5 inches wide. The number and length of your strips will depend on how many yards of piping you need to make. It's common to have to join multiple strips of fabric together to create the yardage you need. To do this, cut the ends of the strips at a 45-degree angle and then join them by creating a seam on the angled ends. This prevents the fabric from being lumpy at the joined spots, since it distributes the seam allowance across a longer area of the piping. Iron the fabric strip to remove any creases. Press the joining seams open as your iron. 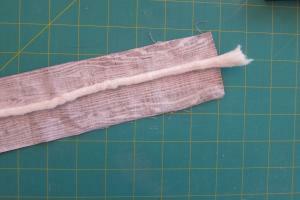 Once you have a long enough strip of fabric, lay the strip face-down on your work surface. Place the cotton cord on top of the strip. Fold the strip lengthwise over the cotton cord, lining up the long edges. Use pins to hold the raw edges together while you work. The fabric should be loosely wrapped around the cotton cord. Adjust your sewing machine stitch length to 5.0 for basting. Using the regular presser foot, keep the fabric taut around the cotton cord. Sew along the full length of the piping. Trim any threads. To use the piping, place it between two layers of fabric that are stacked with the right sides together. Install the zipper foot on your sewing machine. With the fabric taut over the cotton cord, sew the seam according to your project instructions. Making your own piping gives you endless options for customizing your projects. It also saves you money, since cotton cord and fabric are far more budget-friendly than pre-made piping. Experiment with different widths and fabric choices to get a custom look at a bargain price.